Brad and I both love to shop at Sam's Club - there's no doubt about it! 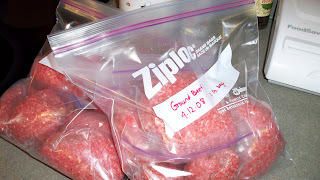 Several years ago we started buying our ground beef there - they have a 90/10 mix that with only 10% fat cooks up really well, and you get the lower fat content without having to pay ground sirloin prices, which definitely works for us! They sell their meat in trays of 6-7 pounds, but we always look for a tray that is as close to 6 pounds as possible - that makes it quite easy to split up. The first trick - wear disposable gloves! It makes the task at hand so much easier and definitely not as messy. 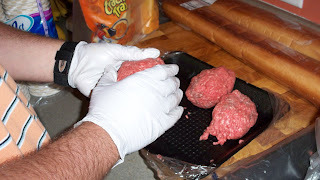 Once again - we bought a box of disposable gloves at Sam's and we keep them in a kitchen drawer...then when we're dealing with raw meat (or other messy chores), we have the option of slipping a pair of gloves on and keeping all the juices off of our hands. I love it! Now on to the meat...once you get home, you can essentially divide the tray in half (which they've pretty much already done for you) and then split each side in thirds. We then ball up the meat and place approx 1 pound in a ziploc sandwich bag. We've found that splitting each pound in half and making 2 balls of meat makes it easy to get the meat into the sandwich baggies without a struggle. Typically one of us wears gloves and divides the meat and the other one of us holds the baggies open while the meat gets dropped in. Once we have all of our meat divided up and in baggies, we label a ziploc gallon freezer bag and place all the individual baggies inside. 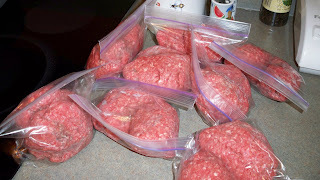 Depending on the amount of meat you buy, it may take 2 gallon bags. 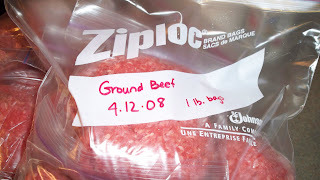 And then anytime you need ground beef for a recipe, it's there in your freezer, in 1 pound increments, ready to go. And there you have it...a great buy on meat and a quick no-mess way to divide it up and make it ready to go when you're ready to cook! Head on over to Shannon's site to check out other great WFMW ideas!